MANY RESIDENTS ARE WONDERING, WHAT DOES THIS MEAN? Upon a split, we receive all schools in our village. We do not need to “buy” teachers, classes, facilities other than eventually one High School. Contrary to what some detractors claim, Caledonia will receive a cash payout in the asset/liability split. We will not owe money to what remains of Racine Unified. We come out ahead. Existing programs, student enrollment remains the same. We will retain programs and classes our residents deem worthy of keeping. Racine Unified has inaccurately implied taxes “may skyrocket,” and led parents to believe a recent vote would significantly raise taxes. They will remain close to current levels. Your student can stay where they are! No forced changes in enrollment, according to state law. This movement is about academic excellence and creating an identity others can share in and enjoy. We want to be a destination, not an island. This is not a unique proposition. Cudahy, Muskego, Union Grove, Greendale and other communities have smaller districts than ours would be, and they’re noted for excellence. Will my student be able to continue at schools in Caledonia if we don’t live there? What happens in regard to the November 2015 referendum/investments? However, a new high school would be needed. The average cost of a new high school is approximately $65 million; this amount can be bonded over several years, but most of it would likely be covered by the payout. The cost to local residents would be minimal over the short term, and likely lower in the long run. Olympia Brown, North Park, Caddy Vista and Gifford. A large 26 acre parcel of land by 5 1/2 mile and Novak would also be included in the asset/liability split with Racine Unified. District officials have slated this land to be a replacement school for Olympia Brown at some point. It is unknown that any tax increases would occur until a feasibility study is conducted, one that factors in every possible variable. Most of the extra costs that could occur for Caledonia are in the building of a new high school, but this would be temporary, not long term. According to recently changed law, new school districts receive 5% start up costs (so does the district left behind – RUSD) and are fully funded by the state of Wisconsin right from the start. 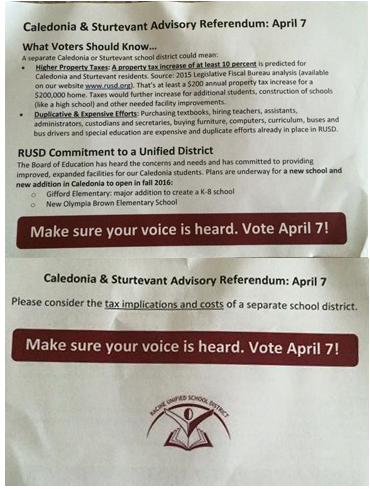 RUSD sent home a mailer on April 3rd, 2015 that incorrectly stated the opposite – there is a fundamental misunderstanding of state law and the feasibility study must happen. The first year’s mil rate will be established by the first elected board, but because of recent reforms in school financing and existing surpluses, we may reap millions more upon a split than previously expected. Yes, Wisconsin is an Open Enrollment state, meaning you can enroll your child in any school district you wish as long as the district has space. Existing students are grandfathered in. Also, 12th graders have the right to finish at the high school they attended regardless of space. Yes, they will. Several parents have been incorrectly told their children will not be able to continue at Gifford Elementary if they’re from Mount Pleasant. Likewise, some staff have employed the words “may not” and “possibly” in describing open and regular enrollment in other schools. This is simply untrue. All existing student populations will remain the same, according to state law. Furthermore, upon a split, Caledonia would begin it’s first school year far below capacity. So any lack of space is simply not a threat to current students. The referendum funds would be treated as an asset and divided accordingly. Any investments by RUSD into Caledonia schools would be retained and completed during the process. Any detailed plans for referendum money must, by law, be used to finish those projects, including by any new school district administration. It should be noted that out of the $128 million, Caledonia was getting taxed $9 million more than it was having reinvested into it’s schools. This differential would be addressed upon a split, by cash or physical assets. Citizens For A Caledonia School District, a 501(c)4 based and registered here in Caledonia, WI as a non-profit organization with the state and are staffed entirely by volunteers. We are. We are a group of concerned citizens who would like to see Caledonia thriving to continue to attract new residents and businesses. In order for this to happen we need strong schools and involved citizens that want ownership in their community schools. Our group raises funds solely for the purpose of educating the public, lawmakers and media on the benefits of creating a new school district, and for the furtherance of future education success in Caledonia. A copy of the Wisconsin Statute governing the creation of new school districts can be FOUND HERE.